Fry all this in a little ghee until reddish. Grind to a coarse powder (some people do make a coarse paste of it, that is fine). Boil diluted tamarind water with tomatoes, turmeric and salt. Add the powder or paste and then the cooked tur dal. Bring to a boil. When a nice aroma emanates, it is done. Season with mustard, curry leaves and cumin using ghee. 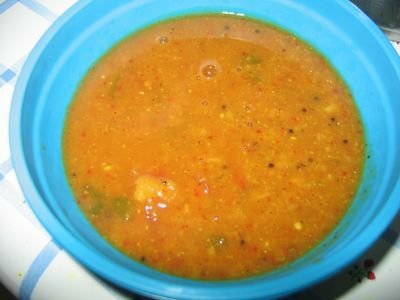 A nice rasam for those days when you don't want to make sambar but paruppu rasam is far too simple (read boring) for you. Yummy rasam, Mika! Looks tempting enough for me run to the kitchen right now!! Thanks!! ha, exactly, Mika... it IS like arachuvitta sambar. I never liked rasam as a kid, but mysore rasam was acceptable because it tasted so much like sambar :) I've never made it myself, so I guess I'll have to try it now! Though I have never tasted mysore rasam , heard abt it. Ur Rasam sounds interesting and will try it sometime. As someone whose mother is from Mysore, brought up pn Saaru as we would call it and as someone who makes it daily - my 2 cents - the recipe calls out for a dash of jaggery. On festivals when puran poli is made, it is customary to add a small ball of the puran. The Rasam powder is a bit more complicated. For one tt also calls for Methis seeds whose mention I dont find here. Also Mysore rasam is not thick, it is thin, the word is 'tili' (soft t) and finally, yes its something to die for! Akapeg-This is how we make Mysore rasam in Tamil Nadu. Of course the origin of rasam could be from Mysore but we tamilians have made it our own :-). In Tamil Nadu, usually there are very spicy few dishes where jaggery is added and rasam is surely not one of them. So may be we have engineered it to cut out the sweetness. I also think Kannada version uses Kopra instead of coconut, which is also an acquired taste for us. This looks very good. A must try!! I am also adding you to my blogroll.. hope you dont mind. Looks like a wonderful recipe! Thanks! Can I offer you a recipe in exchange? 1.Skin and core the breadfruit and cut into medium sized squares; then boil until tender. 2.Chop the onion into thin slices. 3.Grind the grated coconut,green chillies,ginger and cummin to a coarse paste. 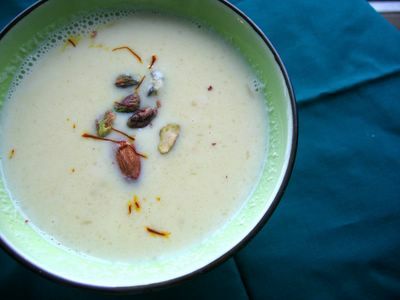 4.Heat two tablespoons of the oil on a medium flame in a pan, season with mustard seeds, add the onion. Saute till transparent. 5.Add the groundpaste and saute for a few minutes. 6.Add the methi leaves and saute for few more minutes. 7.Add breadfruit,salt,turmeric and aleppo pepper and mix throughly. 8.Add ghee and allow it to cook stirring occasionally, making sure that all the breadfruit pieces are coated with methi leaves mixture. Even my mom prepares this rasam.First time on ur blog.Good to c a blogger from Bayarea. Long time..No post, Mika! All's well at your end? Wishing you and family a happy and subha Deepavali! Happy Deepawali Mika to you and your family! Here is my personal invitation to participate at VCC Q3 2006. We have extended the deadline to Oct 31. See you at the show. Cheers! Submit you blog to our Food Blog directory while you there! Thanks for this authentic South Indian rasam recipe. Mysore rasam with medu vada is a lethal combo which my family just relishes. Thanks for the recipe, Mika! I made this and it tastes absolutley heavenly!